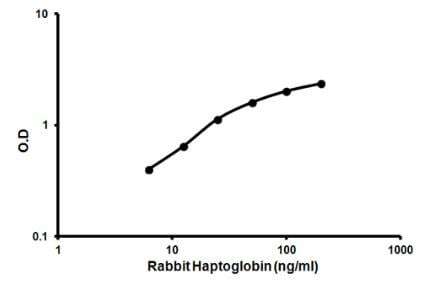 Abcam’s Haptoglobin Rabbit ELISA kit is an in vitro enzyme-linked immunosorbent assay (ELISA) for the quantitative measurement of Haptoglobin in rabbit serum and plasma. In this assay the Haptoglobin present in samples reacts with the anti-Haptoglobin antibodies which have been adsorbed to the surface of polystyrene microtitre wells. After the removal of unbound proteins by washing, anti-Haptoglobin antibodies conjugated with horseradish peroxidase (HRP), are added. These enzyme-labeled antibodies form complexes with the previously bound Haptoglobin. Following another washing step, the enzyme bound to the immunosorbent is assayed by the addition of a chromogenic substrate, 3,3’,5,5’-tetramethylbenzidine (TMB). The quantity of bound enzyme varies directly with the concentration of Haptoglobin in the sample tested; thus, the absorbance, at 450 nm, is a measure of the concentration of Haptoglobin in the test sample. The quantity of Haptoglobin in the test sample can be interpolated from the standard curve constructed from the standards, and corrected for sample dilution. Defects in HP are the cause of anhaptoglobinemia (AHP) [MIM:614081]. AHP is a condition characterized by the absence of the serum glycoprotein haptoglobin. Serum levels of haptoglobin vary among normal persons: levels are low in the neonatal period and in the elderly, differ by population, and can be influenced by environmental factors, such as infection. Secondary hypohaptoglobinemia can occur as a consequence of hemolysis, during which haptoglobin binds to free hemoglobin. Our Abpromise guarantee covers the use of ab157727 in the following tested applications. ab157727 has not yet been referenced specifically in any publications. Publishing research using ab157727? Please let us know so that we can cite the reference in this datasheet. There are currently no Customer reviews or Questions for ab157727.